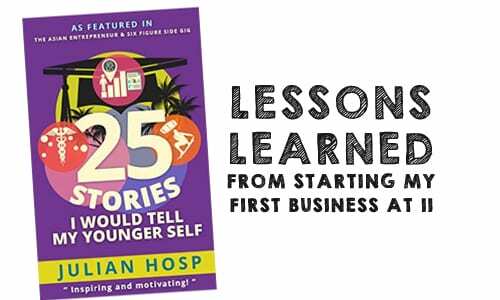 In my recently published book, “25 Stories I would tell my Younger Self,” I share a story of how I started my first business at 11. I don’t want to talk about the story so much as to focus on the entrepreneurial lessons I took away from that time. It all started when my friend Peter and I realized that our school cafeteria was not doing a great job serving us students…so the two of us decided to set up our own little sandwich business and run it from our classroom. The venture was a great success – and by that we mean we expanded so rapidly that we had to “employ” other kids to help us with the operations. Eventually our school’s officials shut us down, but in that short time, we learned some key entrepreneurial lessons. First, if you want to start your own business, the best way to do so is to spot a need in the marketplace. Chances are, if you experience a problem, others experience it as well. If you manage to come up with a solution, perhaps you can earn money from it – almost any great business starts this way. Facebook came out of Mark Zuckerberg’s capitalization on the need for college students to exchange information.” Steve Jobs and Steve Wozniak started Apple to bring computers to the masses. These are only a few of many examples, but they all have one common denominator: the founders spotted a need in the market and built a solution to cater to that need. At my young age, I was not able to spot large problems, because I didn’t really have any. But it was clear to my partner and I that the lunch situation was a problem to many, and that there was a need for improvement. I now make it my daily mission to find five “problems” and solutions every day. Spotting a problem is often not very difficult, the ‘magic’ of course is in the solution. This is an easy exercise and something everyone can do. To begin, simply start being more aware of daily challenges you encounter and you will be amazed how many problems are awaiting solution and could be a new business opportunity. It is important to note that ideas on their own are pretty much worthless. If you are going to solve a problem, be prepared to work hard, it’s all about the execution. Many other kids considered starting a sandwich business in our school, but only we were willing to wake up two hours early to make it happen. The second lesson I learned was that WIN-WIN is a key to successful business. The sum of parts is greater than the parts themselves, but in nearly all cases you are taking market share from another business. For Apple this meant that profits for IBM, Microsoft, and Samsung would be negatively affected. For Google this meant that AltaVista, Yahoo, or both would have to give up market share. In my case, the school Cafeteria was losing its market share to our business. I didn’t really understand this at that time. I just thought: “Great, we have dozens of customers every day, how awesome is that?” Well, I then learned that someone was missing revenue because of us selling sandwiches. Nowadays, when I start a business I ask myself: “who will benefit from what I am about to do, and who may lose out?” Best case scenario of course are WIN-WIN-WIN situations, where not only you and your customer are winning, but the competition as well. This is more difficult to achieve, but such ventures are very long lasting. The third lesson was an obvious one: expect the unexpected! Even though it may have been clear to others that our business would be shut down, it was a surprise to me and my partner. When asked, most business owners would tell you they did not “see it coming”. These 3 lessons can be applied to any “grown-up” business as well. So, before starting your own business, ask yourself – is there an actual problem you are solving? Is your solution benefiting others? Lastly, expect the unexpected and whenever possible go for a WIN WIN WIN, where the sum of the profits are greater overall for each participant. Got something to add or comment? Would be glad to get your feedback either below, on my website: 25stories.org or on Facebook. By Dr. Julian Hosp, author of the #1 bestselling book on Amazon: “25 Stories I would tell my Younger Self” – blueprint for millennials to succeed in life. Dr. Julian Hosp is an author, entrepreneur, and leapfrog high performer. Julian was born in 1986 in Austria. In his teens he played professional basketball in Austria and then went on to become a professional kitesurfer for almost ten years. There he wrote his first book, “Kitesurfing Tricktionary”. He graduated from Innsbruck Medical University in 2011, but later he decided to employ his hard-earned skills and discipline in the business world, rather than in medicine. Looking back, he describes that decision as one of the hardest ones in his life, as both his family and friends expected him to develop a career as a medical doctor. In 2012 Julian moved to Hong Kong, together with his partner Bettina, to expand his business ventures in Asia. Today he is not only a successful author and entrepreneur, but has become a much sought-after public speaker, coach, and social-media-strategist for individuals and companies all over the world. His life motto is “work-life-balance is all about doing that one thing 100%” and his favorite food is the fastest food available to save time. At the time of writing this, Julian is iving in Hong Kong and when not pursuing his next venture is out playing basketball or rocking the waves, kitesurfing.